"Emerald Lady" The female Ruby Throated Hummingbird does not have the glowing red throat like her mate does but she is so perfect in her own unique way. 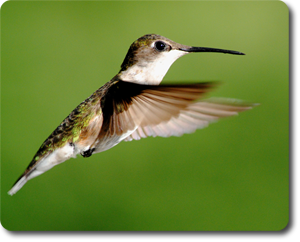 Hummingbirds are amazing and blessed with flying skills no other group of birds can match. They are the only birds that can fly backwards and even upside down! This pretty girl was captured gleaming in the morning sunshine at my home on in eastern Daviess County, Kentucky.